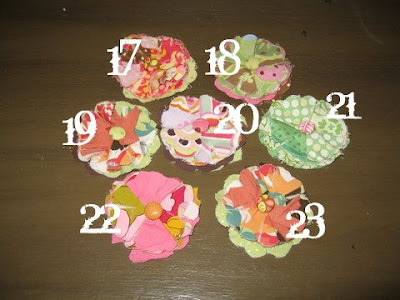 each handmade flower brooch comes with a bar pin on the back to attach it to your favorite shirt or bag. looks great in three’s. 1 for $6, 3 for $15 plus $2.50 for shipping. email me at 5cheneys@gmail.com with any questions. *another edit* – i just found a handful more of these in my stash, so i thought i’d put them up for you. also, i made some a.dor.a.ble little flowers (slightly smaller than the brooches) with clips on the back for your hair. my girls love them and they stay in all day. a girlfriend of mine wears hers at the base of her ponytail. super cute! here they are: hmmm… i just realized i made 2 #17’s. ooops! just let me know which of the 2 you prefer if you are interested. the clips are the same price as the brooches. feel free to combine them for the 3 for $15 discount! *edit* – 3 and 4 are sold! 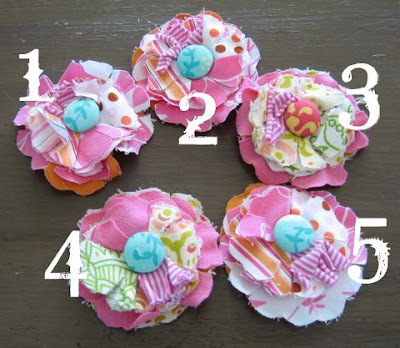 10 comments for "more flower brooches"
soo cute! i love these…. Did you come up with a name for your store yet? I couldn’t find it in your previous posts. I love these! I bought some from Lindsey last time and I wear them all the time – on my sun dresses, tank tops and t-shirts! i played your abc game, are you happy. Hey linds- are these able to be magnets like the last ones? I have on my fridge and it looks so stinkin cute that i’d love a couple more. I wear my pins a lot too! all of these have the pins already attached to the backs, but let me know any particular ones you like and i’ll do my best to recreate them with a magnetic backing! i’m glad your happy with yours! i also just made a bunch of fabric flower hair clips – really fun! LOVE them and want to feature them on my blog.